The Dresden in Kalorama is one of those buildings that is so elegant, so refined, that its name must only be whispered in quiet tones. There, you said it -- "The Dres-den." 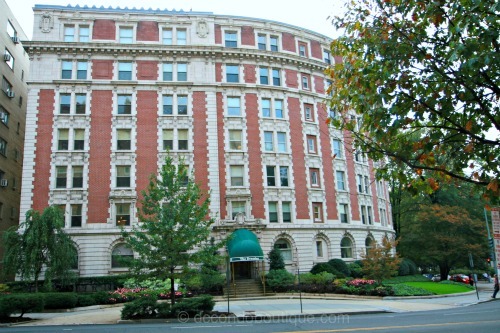 Built at the corner of Connecticut Avenue and Kalorama Road in1909, the building boasts one of the most distinctive features of any building in the District -- a "rounded facade" that extends to pie-shaped homes in three of the building's seven levels. Renowned developer, Harry Wardman, who was responsible for many of the notable early 20th century buildings in DC, specifically constructed the building to allow for light-filled floor plans, the better to showcase the stunning views looking toward the Taft Bridge. An unexpectedly lush rooftop garden provides a quiet respite from the buzz of urban life with its tropical greenery and expansive views of the cityscape. Wardman also included a small lawn at the rear of the building that has since been converted to parking lot, providing surface parking spaces for 24 of the unit-owners. The Dresden is considered Wardman's "Symphony" -- one of his most elaborate constructions that is now a certified Washington landmark with its entry in the "Best Addresses" in DC. Until 1974, the Dresden was a rental property before conversion to a 62-unit condominium by architect Peter Voghi. Today the apartments range from 1,000 to 3,200 sf of gracious living space, retaining much of the charm of the original plan. Soaring ceilings and parquet floors are accented by intricate crown moldings and oversize windows. Luxurious finishes extend to ceiling centerpieces and the type of custom millwork that is extremely rare today. The most impressive homes are on the fifth tier with seven rooms, two baths, a large reception hall, gourmet kitchen and servant's quarters. Despite a series of renovations in 2012, the entryway and lobby also remain true to the original design with wide hallways, marble wainscoting and tiled flooring. The first floor overlooking Connecticut Avenue features eighteen massive windows with scrolled keystones within the limestone facade. And with a nod to its genteel past, a uniformed doorman greets residents while a concierge staffs the front desk 24 x 7. 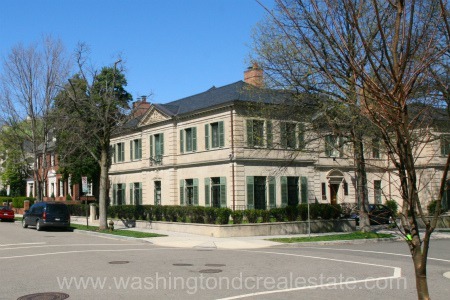 With its embassies and plethora of restaurants and shops, Kalorama is home to a number of prominent Washingtonians. A highly walkable neighborhood with easy access to two Metro Stations on the Red line (Woodley Park and Dupont Circle), Kalorama features serenity and beautiful views just blocks from the heartbeat of the City. And, the Dresden, of course, combines classic grandeur and generous proportions with the conveniences of modern living.